Yesterday, we reported that the latest issue of Famitsu magazine could well be featuring some news on a fresh instalment in the Etrian Odyssey series. Leaks from Japan suggest that the magazine will be unveiling Etrian Odyssey: Millennium Girl for the Nintendo 3DS. The game is expected to launch in Japan on June 27th, and will retail for 6279 Yen. Details are thin on the ground at present, but Famitsu is reporting that Millennium Girl will be a remake of the original Etrian Odyssey with an expanded storyline and voice acting. Famed composer Yuzo Koshiro is once again providing the soundtrack. Are you looking forward to experiencing the original game from a fresh perspective? Or would you rather have seen an all-new adventure? Drop a comment to let us know. Might be interresting as I've never finished the first one. It's getting a bit ridiculous now. You can play the original in your 3DS. Fed up of remakes. Too bad not everyone has access to either the original or reprint version. Besides, they would probably add new features, like Casual mode, to bring in those who want to play the game in its entirety without the super hard difficulty. I would personally love to get this. IV is a great game, and it would give me a chance to play yet another one of these epic games. @XXIV You type in Amazon.com and search for the name of the game. You can get it for 30 bucks. Really not hard. I just got it a few months ago and really enjoyed it. ON MY 3DS. A remake already is pointless. Umm yeah. They would have to make a bunch of improvements to the original for me to double dip. I understand though not everyone might have played the original. Never played the original so looking forward too a much improved version of it! Unless you can't get a credit card, in which case no you can't. @XXIV Who older than 16 doesn't have a bank account with debit card? Are you serious? 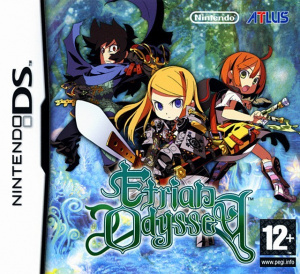 the new one (Etrian Odyssey IV) is already pre ordered, quite excited for it! @Nekketsu3D Uh wut? Every Etrian Odyssey game has been released in the West (North America). @Nekketsu3D It has a very good chance of coming over. It's obvious that ATLUS used EOIV as a testbed to see if the other games might stand a chance of more widespread international appeal, and so far from the response to EOIV, I think there's a very good chance this will come out globally. The company is also one of the big reasons we'll see it — it's published by ATLUS, not Nintendo directly, and ATLUS so far has built up its reputation to the point of having a loyal fanbase for almost all of its game imports. Also, SMT is enough of a juggernaut that they can afford to take some risks here and there. Wow that's great! I never played the original and hear it's hard to find so this is perfect! Atlus is going to bankrupt me. But seriously, awesome news. This will give me a fresh perspective on the original. Good. This means I don't have to buy the original. Figured. Good news, though, still. I'll probably pick it up if they change a lot. Stop the freaking remakes and ports already!! I'm willing to bet this will go 3D like lV did instead of sprites so that right there is a pretty big change. How about they just release 2 and 3 in Europe already instead. I'm so glad that DS games have no region lock! Expect a february/March release for this. IV released July 5th in Japan and hit America on february 26th so a similar timeframe is likely for this game. @DarkCoolEdge Just don't buy them. We still get brand new entries in their series often despite the ports/remakes so whats the big deal? Persona 4 golden came out on Vita but we know Persona 5 is in the making. We learned about this just today but etrain odyssey IV is still rather recent. I for one am quite excited. I have the impression that latter games have been more popular. I never played any of the first three, so I'd give this one a whirl for sure. @Pikachupwnage They still get resources that would be useful in brand new games. Plus limited shelves in the stores. I never played the original, so what better way to play than an enhaced remake? Just let us download the three original episode for a budget price!!! In Europe we are still missing n°2 and n°3!!! I only recently bought the reprints of the original 3 Etrian games (I'm in Europe) from a seller on Amazon UK....they were pretty cheap and work fine on my UK 3DS. They're certainly not very hold to still get hold of for cheap either. I'm currently playing the first game...it is tough, but not impossible and I think a lot of people exaggerate wildly about it's difficulty. It requires patience more than anything else. Trying to rush forward all the time WILL get you killed. Thinking about what characters you need (always ensure you've got a couple of good frontline characters and a medic to back them up) and slow steady progress with levelling up and learning a few decent skills before trying to take on harder enemies is the way to go. I'll be interested to see how this remake turns out. My first EO was IV, so I'd get this! Never played first one so that'd be cool. I have the original but I'm not bothered at all by a remake, as long as the new features make a repeat play through worthwhile. The original game was overlooked by a lot of people and the difficulty is notoriously off-putting. For myself the game is still playable, difficulty doesn't scare me when the answer is straightforward and grinding seems very doable in that game. I think this game would be a lot better remade. The series as a whole has become easier to map, and expanded the overall gameplay. My son is playing the 1st one and it actually seems quite archaic compared to EOIV. So this would be a great game to remake. 2 and 3 probably not as much. Plus the graphical improvement wont hurt, but I don't care to much about that. Excellent news since playing this will not cancel out Streetpass while playing. The first one is my favourite... I am all for this. If or when EO:MG comes to America, I will buy it on day 1! I had a chance to buy the first one but the 2nd one was right next to it and I opted for the more recent version. Now with the remake, I will be able to (hopefully) enjoy the game (if I don't end up throwing my 3DS in frustration ). I'm all for the remake not just because I never played the first one but because I hate how the DS graphics are displayed on the 3DS. The stretching and bleeding of colors just bother me to the point where I've turned off the game after a few minutes of playing. The remake would at least readjust the size of the screen even if the graphics are left as is (which I won't mind). However I will be ecstatic if the graphics received a face lift and even 3D'd.